Korean War veterans finally had their day in the sun. Four days actually, and the sun definitely did shine. The Korean War Veterans Memorial was dedicated in Washington DC on July 27, the 42nd anniversary of the end of the Korean War. The four-day celebration closed with a military parade down Constitution Avenue near the White House. The temperature reached 93 degrees during the dedication ceremony Thursday afternoon. Five hundred people were treated for heat exhaustion. 600,000 bottles of water were distributed. Mercifully, the ceremony started early and lasted less than half an hour. President Clinton and South Korean President Kim Young Sam spoke. President Kim's remarks were given in English after he finished. 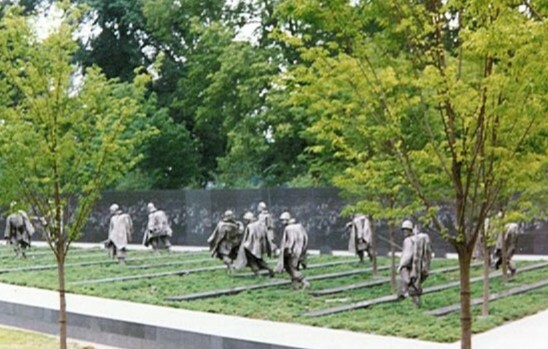 The $18 million Korean War Veterans Memorial occupies 2.2 acres of the Washington Mall. It sits directly southeast of the Lincoln Memorial and across the Reflecting Pool from the Vietnam Veterans Memorial. Nineteen poncho-clad combat infantry troops, seven feet tall and made of stainless steel, trudge wearily across a triangular field of juniper shrubs. Fourteen are soldiers, three are Marines, one is a Navy corpsman, and one an Air Force forward observer. They are white, black, American Indian and Korean. Rifles in hand, they look as if they are on patrol, tensed for battle, leaning into the cold wind. A flagpole and round "pool of remembrance" are positioned at the apex of the triangle. Along the left side of the triangular field, a low curb contains an alphabetical listing of the 22 countries that fought under the United Nations banner. A 164-foot memorial wall runs along the right side of the field. Looking out from the polished black granite wall are 2500 faces of cooks, nurses, engineers, sailors, mechanics, aviators, chaplains, drivers, supply clerks and other personnel who supported the ground troops. These images were taken from actual Korean War photographs, digitally altered so the light source appears to come from the flag, and sandblasted into the granite. An inscription high on the wall proclaims: FREEDOM IS NOT FREE. Two rows of large white tents were set up on the Mall for the celebration. Tent City opened Wednesday to welcome the expected 100,000 visitors. The Veterans Administration tent offered information on medical and other veterans' benefits. The American Legion and VFW tents tried to sign up new members, as well as offering resting places out of the hot sun. There were medical and food tents, a museum, a Mobile Vet Center with 40 volunteer counselors, a show tent with chairs and a stage. South Korea had its own tent; the other allies shared one. Computers in the air-conditioned Memorial Tent provided printouts of service members killed during the war. Unlike the Memorial Tent with its artificial flooring, most tents were set up directly on the grass. The humidity and thousands of footsteps churned the ground into a sticky mess and made the inside of the tents smell like silage. As I wandered through Tent City, two Marine veterans from Mott, North Dakota, struck up a conversation. When I said I was from South Dakota, they invited me to join their American Legion post in Mott. I told them I'd have to join in Clear Lake, with my parents and brothers. They said Mott wasn't that far away, "just up the gravel road from Lemmon." The parade Saturday morning lasted almost two hours, a steady stream of people marching in the hot sun. It was arranged by seniority of service, with the Army first, then the Marine Corps, Navy, air Force and Coast Guard. Each service was lead by its active duty band and drill team in dress uniform. Then came the veterans of that service, grouped by Korean War combat unit. Most wore regular tourist attire--shorts, polo shirts, ball caps. Some units dressed alike, such as the Army's 2nd Division with its Indianhead T-shirts. Veterans' organizations from across the country followed the five services. The allied nations made up the last fourth of the parade. South Korea came first, with the Ministry of National Defense Honor Guard and Military Band. 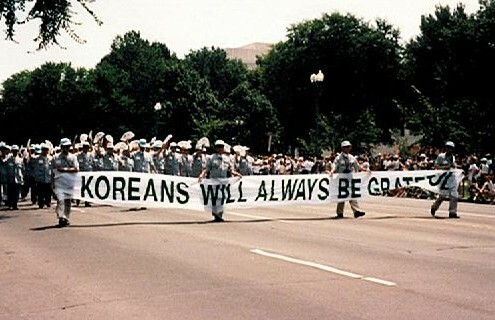 Hundreds of South Korean veterans marched, carrying banners that said, "Koreans will never forget." They shouted, "Thank you, America!" "Thank you, thank you!" Smaller groups of veterans from the other countries, interspersed with bands and ceremonial dance teams, wrapped up the parade. Approximately 1.5 million Americans fought in the Korean War, which lasted from June 1950 through July 1953. Of those, 54,246 died and 8,177 are still missing. An inscription at the Memorial says they "answered the call to defend a country they never knew and a people they never met." Today 37,000 American troops are stationed in South Korea. According to one of the South Korean veterans who came to Washington DC for the celebration, "The Korean War is not over for us. We still have trouble between the North and the South."